Recommendations:Use alone or in tank-mix combination for control of chewing or sucking insects on indoor or outdoor ornamental plants, trees, shrubs, flowers, fruit, and garden vegetables. 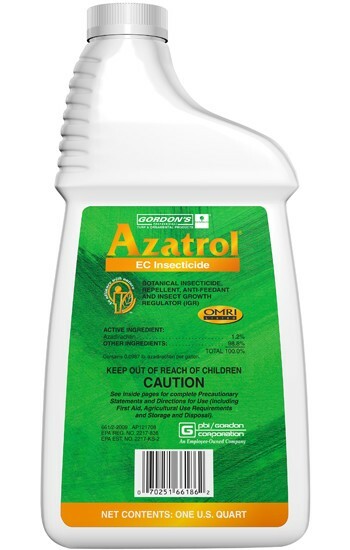 An azadirachtin insecticide formulated to provide broad spectrum insect control with very low environmental impact. Azatrol provides all the benefits of azadirachtin, a proven natural anti-feedant, insect growth regulator, anti-ovipository and repellent, as well as a toxin to soft bodied insect larvae. The benefits to your insect control program are multiple. Anti-feedant: Insects will feed less or not at all on treated plant tissue. Foliage is not damaged and insects ultimately starve to death. IGR: Insects will fail to mature and reproduce, eliminating populations over time, or keeping populations at acceptable levels. Anti-ovipository and Repellent: The likelihood of insect infestation is greatly decreased in treated plants. This also adds a preventive aspect to your control program. An application of Azatrol does not provide the quick 'knock-down' of a contact poison. However, 21 days after treatment, insect control is comparable to the standards. The end result — insect population control — is obtained. 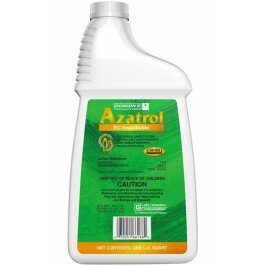 If Azatrol is used as a preventive treatment throughout the season, prior to insect infestation, the goal of protecting plants, ornamental flowers and shrubs and trees will be accomplished. Tank-mix combinations of Azatrol and other insecticide products have been shown to have synergistic activity. Azatrol's mode of action can significantly enhance the effects of other insecticides, making it the perfect choice for Integrated Pest Management (IPM) programs. Azatrol does not harm beneficial insect populations including predator wasps and wasp larvae, ladybugs, preying mantis and other predator insects.